Lake was not formally trained in art but I have been an artist my whole life and some of her first memories are of drawing with her beloved crayons. She developed a good base of skills in a 4-H ceramics class and was taught well the importance of detail, and to finish your work. Terralynn also learned a myriad of faux finish techniques. From there she continued to work in high school and even convinced her teacher to allow her to take both Art III and Advanced Art in the same semester. During her adult life, she has done set work for a local community theater and her kids had ultra-creative bedrooms. 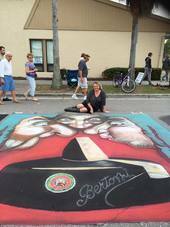 Terralynn discovered street painting in 2009 when she did her first painting a year later and have not stopped since. She is honored to be a part of this community, this family and have the opportunity to meet some fantastic people, travel and really grow as an artist and person. Artistry runs in the family, her daughter and son are also very talented in performing and visual arts. Her husband Tim has “mad” vocals and is a star on the local stage. Terralynn feels like a very lucky lady and is loving that her grandchildren are enjoying “arting”.